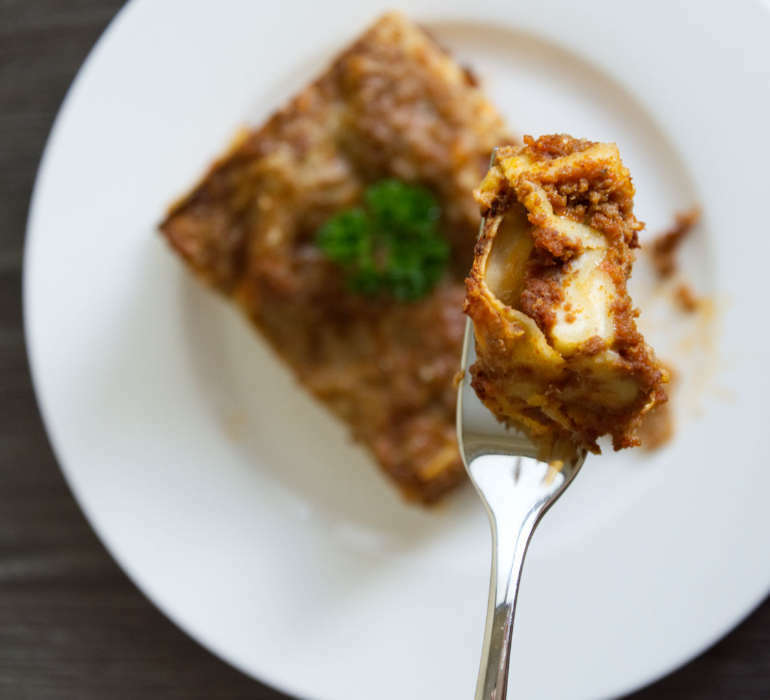 Looking at the etymology, most probably the name “lasagna” comes from the Greek word “laganon” which means a flat sheet of pasta dough. Other theory says that it comes from the greek word “lasanon” which means “chamber pot”. In Italy, the first time was mentioned in the book “De re coquinaria”, written in the late 4th or early 5th century AD by Marcus Gavius Apicius. De re coquinaria described Roman cooking recipes. There is also another theory saying that the recipe was developed based on an English dish called “Loseyn” in the 14th century. This recipe didn’t contain tomatos, as they arrived in Europe after Columbus. Almost in every house I know, Lasagna alla Bolognese is a standard dinner dish. It’s considered quick and easy. And that’s how I got to know lasagna – quick and easy. After I have lived in Italy I have tried another version of that dish but that still wasn’t this I discovered looking for traditional recipes. The real Bolognese supposed to be cooked for over 2 hours and trust me, you have never easting such minced meat before. It’s the best lasagna I and my husband have ever eaten. The traditional way of cooking won again! Chop onions, carrots and celery into small pieces. Heat up butter on the medium heat in the deep pan. Add chopped vegetables and leave until tender. Add minced meat and wait until meat turns brown, stir from time to time. Add glas of red wine and wait until it evaporates completely. Add 150ml of broth, salt and pepper. Take 100ml of the beef broth and dilute the tomato paste in it. Add the mixture to the meat and stir it. Cook on the low heat for 1,5 hour. Add the glas of milk. Stir again. Grease the casserole dish with butter. Place first a layer of meat, followed by the layer of pasta. Place layer of béchamel sauce, Ragu and parmesan and pasta again. The last layer should contain a mixture of the meat sauce and béchamel and be sprinkled with parmesan. Put lasagna the casserole with lasagna in oven and bake to 50-60 minutes. Leave to rest 10 minutes before serving.